I was to make items for 4 people. Whether they liked them or not, it didn't matter. They were to receive "gifts".... something out of the creative minds of..... oh who knows... sounds strange right? Well this sort of was fun in a bizarre way. I had to work with three women and one man. The guy was fairly easy - I mean, its a guy - so if he doesn't love it - what happens? He gives it to a woman! LOL.. so essentially, I am making it for 4 women! Now, I do not want to make them season items. Or too femine. OR... well it should not matter! Here is idea number 1) calendar. Simple enough that everyone needs to know what day it is, and I can say that atleast ONE of the women likes PURPLE.. so I have one thing done! 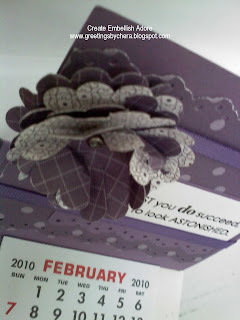 I used the scalloped circle punch, on the lovely lilac DSP. I then cut the petals every second one, and crumbled them up. Centered a brad in the and attached to the top of the easel card that was on the top of the drawer. 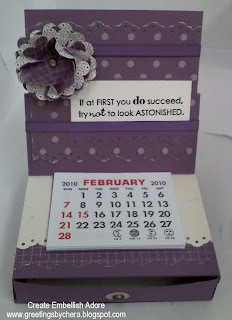 The easel part is tucked behind the calendar top... if you follow that. It allows the item to fold down - unless there is a bow or big flower punched on the top! (as seen here.. ha ha). The fact that I have about 6 more calendars left might mean they all get something of the like! That isn't totally true, I have something alittle more masculine for the guy! 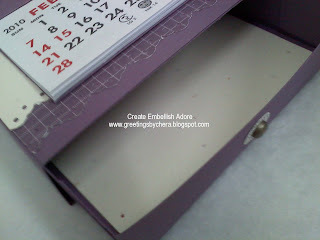 I love your little box calendar thingy, do you have instructions on how to make it? I think it is adorable and would love to case it.